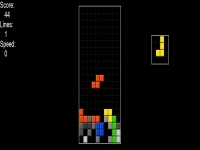 view all images (3) If you miss the old classic Tetris which almost everyone probably played at least one time, this is an old fashioned and simple game. You can keep highscore, access options through right click and change game speed from 0 to 9, gris width, intensity and shade level. You can also choose to show or not the next piece, to make the game more interesting. This game has 2 modes: Tetris and Pentix. It shows current score, lines and speed.